At five years old, NMC’s Costa Rica study abroad program has many age-appropriate traits: it’s thriving, energetic, and ready to explore. It’s also something most five-year-olds are not: The Central American nation from which a dozen NMC students returned this week is the most mature of NMC’s study abroad experiences. Started in 2011 by Constanza Hazelwood of NMC’s Great Lakes Water Studies Institute, the heart of the experience is a partnership with EARTH University, an internationally renowned agronomy school near the Costa Rican port of Limón. This year, students in Freshwater Studies, Aviation and Plant Science all took part in the two-week sojourn on the tropical isthmus connecting North and South America. The multi-disciplinary nature of the 2015 trip is one of the key signs of maturity. Another is reciprocity. 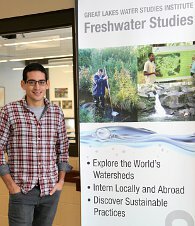 Last fall, the GLWSI hosted EARTH researcher and faculty member Alex Pacheco as a guest lecturer. Pacheco then invited another colleague to propose a project for this year’s trip that combined the skills and experience of NMC students in both Watershed Science and Unmanned Aerial Systems: an examination of the spread of Sigatoka negra, a fungus that threatens banana production around the world. “I have been to Costa Rica before, but this time I am not just a tourist, I am there to make a contribution. 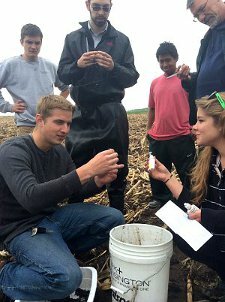 We are helping maintain a healthy watershed surrounding a banana plantation,” said Water Studies student Eoghan O’Connor. 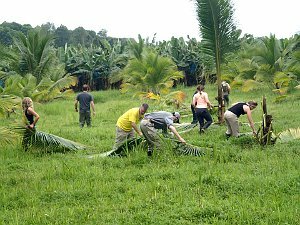 To that end, students wielded both machetes and eBee, a professional mapping unmanned aerial system (UAS), on a banana plantation. Under Hazelwood’s guidance, they evaluated the effects of a buffer zone along the shorelines of the river running across the plantation. “Our partnership with EARTH has grown into a solid network of professionals working together to solve relevant environmental problems impacting the globe’s water resources,” Hazelwood said. They also practiced their Spanish in a home stay experience and soaked up as much culture and local lifestyle as possible. “This whole experience has been beyond incredible. All of us students have described it as sensory overload. Touch, smell, sight, taste has all been so beautifully overwhelming,” Water Studies student Taylor West wrote on her blog. Now back home, trip participants are preparing to debrief and discuss how their internship in Costa Rica can serve as a template as NMC’s Office of International Services and Service Learning seeks to offer more study abroad experiences in service of the college’s strategic goal to ensure that NMC learners are prepared for success in a global society and economy. "Successful foundations like those with EARTH University allow us to think creatively when building future opportunities for multi-disciplinary study abroad,” said director Jim Bensley. As a student at Michigan State University, a national leader in study abroad participation, Ryan Rosero had a wealth of study abroad options. But the 2008 Suttons Bay High School graduate discovered that he wanted to “stray from the beaten path” and that none of MSU’s options fit quite right. Meanwhile, his mother had met Constanza Hazelwood of NMC’s Great Lakes Water Studies Institute at a local event and suggested that her son talk with her. In 2011, Rosero accompanied Hazelwood and NMC students on the first study abroad trip to Costa Rica. He went again in 2012. The experiences were life-changing, both in terms of altering his career direction from engineering and to seeing what the wider world held. 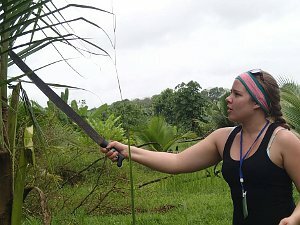 “My time abroad helped me realize the potential for renewable energy in developing countries while falling in love with the language and Latin American culture in general,” Rosero said. After his MSU graduation Rosero made a third trip to Costa Rica through MSU and the Universidad de Costa Rica and started thinking seriously about working abroad. Adopted from Colombia, Rosero holds dual U.S.-Colombian citizenship. He moved to Colombia in March 2014 where he now works for Westeva, a renewable energy start-up. “My experiences with NMC were more influential than my studies at MSU in the decisions I have made early on in my career,” Rosero said.